The National Framework of Qualifications (NFQ) is a ten level system that provides a way to compare qualifications and ensure that they are recognised nationally and abroad. Each of the ten levels are used to describe the Irish qualifications system and each level is based on national standards of skill, knowledge and ability ie. 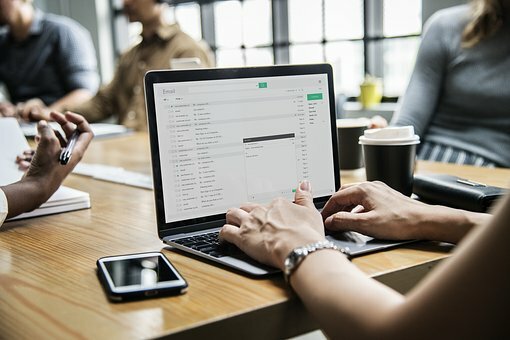 what a person is able to understand and do after completing a process of learning, with the higher numbers indicating a higher level of education. 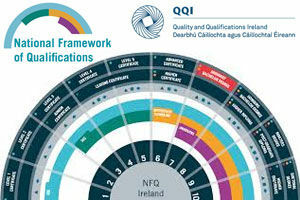 The NFQ system places the Leaving Certificate at level 5 and the Leaving Cert Applied at level 4. From the Leaving Certificate, students are able to apply for courses from level 5 to level 8 (level 9 and 10 are Master’s and PHD courses for which a student needs a level 8 qualification). The NFQ allows students to use the system like a ladder; so whatever step you start on, you can move to a higher level and it can be done in a number of ways. On entering the system at level 5, Post-Leaving Certificate students may use this qualification to move to higher education, mainly through the Higher Education Links Scheme. This scheme means that students are able to apply for places on CAO courses which includes level 8 courses. Applicants submit an application to the CAO by February 1st but there is no guarantee of a place. However, it does mean that students will have a chance to compete on the basis of their QQI qualification instead of their Leaving Cert results. Presently, over 600 CAO courses accept any QQI level 5 qualification for places. Some courses require the qualification to be in a specific area or that it contains certain subjects. So students with a level 5 qualification have two ways in which to apply for a course; through the CAO, where their qualification is given a points score, or by applying for a ‘linked’ course; where a number of places have been set aside for QQI (formerly FETAC) applicants. Students who enter at level 6 in an IT (Institute of Technology) or TU (Technological University) frequently have the option of staying on in that institution to do a level 7 ‘add on year’ followed by a level 8 ‘add on year’. This means that a student can acquire a level 8 qualification in four years. As most level 8 (or honours degree courses) are four years in length, it is likely to take the student the same amount of time to reach level 8 as a student who enters on level 8. In many cases, a student will be required to achieve a certain grade in order to do the level 7 and 8 ‘add on years’. Entering the system at level 7 and moving on to level 8 follows the same procedure as level 6 moving to level 7. A lot of the level 7 courses have an optional ’add on’ year to take them to level 8 and students need to enquire with the college or check the CAO handbook. The abbreviation DG in the handbook signifies that it is an Ordinary Degree course while HD signifies that the course has an option to add on a year to make it an Honours Degree. 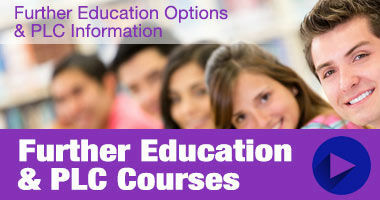 HC+DG+HD means that a course is a Higher Certificate with the option to do an Ordinary Degree and an Honours Degree. 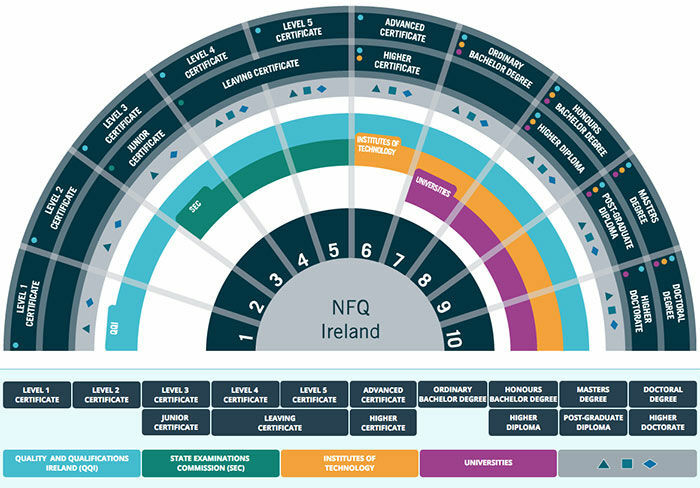 For more information on the NFQ system check out the website www.nfq.ie or check below for an interactive fan diagram that clearly displays the different levels, award types and the awarding bodies.